Today’s 1pm rally moved to Boardwalk pavilion at Brighton 4th St, few blocks west of Coney Island Ave, if still raining. Please spread the word! After Bill de Blasio’s campaign rhetoric as the choice for voters who wanted to reject Bloomberg’s policies, we’re disappointed with the Mayor for not only continuing the Bloomberg-approved Concretewalk but failing to listen to local council members and the community. All year, letters and requests for an environmental study and a meeting to discuss the Coney Island-Brighton Beach Boardwalk with Parks Commissioner Mitchell Silver were rebuffed. Finally a charade of a stakeholders’ meeting was hastily arranged on the day before New Year’s Eve. 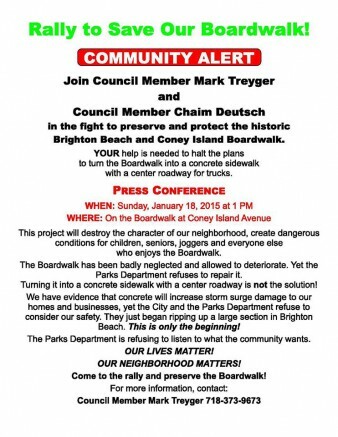 On Monday evening, Councilman Mark Treyger, who represents Coney Island, and Councilman Chaim Deutsch, who represents Brighton Beach, put out a call for a rally and press conference on Sunday, January 18th. Rally to Save Our Boardwalk! Join Council Member Mark Treyger and Council Member Chaim Deutsch in the fight to preserve and protect the historic Brighton Beach and Coney Island Boardwalk. YOUR help is needed to halt the plans to turn the Boardwalk into a concrete sidewalk with a center roadway for trucks. This project will destroy the character of our neighborhood, create dangerous conditions for children, seniors, joggers and everyone else who enjoys the Boardwalk. 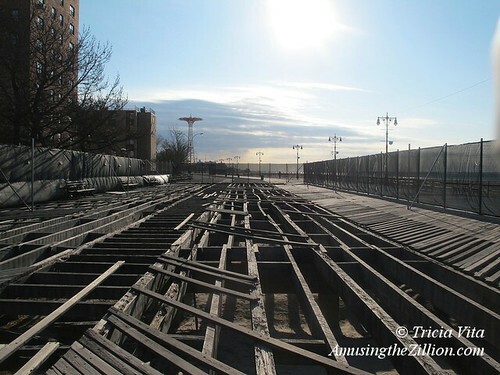 The Boardwalk has been badly neglected and allowed to deteriorate. Yet the Parks Department refuses to repair it. Turning it into a concrete sidewalk with a center roadway is not the solution! We have evidence that concrete will increase storm surge damage to our homes and businesses, yet the City and the Parks Department refuse to consider our safety. They just began ripping up a large section in Brighton Beach. This is only the beginning! The Parks Department is refusing to listen to what the community wants. Come to the rally and preserve the Boardwalk!